A friend of mine had an essay about surviving after divorce published on HuffPo yesterday and became the target of many, many troll attacks in the comments and also on Twitter. Some super-ugly attacks. This post isn’t about her piece, so I won’t link it. This post IS about the sense of entitlement people on the internet feel to bash, insult and generally be vile toward other people. Today, it seems that free expression is defined as the ability to publicly trash others. People throw around First Amendment like it applies to websites–it doesn’t. It only applies to government restrictions on free press. Not to what limits individual media vehicles might set. But of course, they don’t set limits. This has long disturbed me. It’s not the main reason I won’t write for HuffPo–that’s because they don’t pay and I value my work more than that–but it is certainly the downside of writing for any online publication that does not monitor comments. Why are so few comment boards moderated? Because that would require setting limits, and hiring monitors and all sorts of things online publications want to avoid. But most important, trolls are eyeballs and bring more eyeballs, which translates into revenue and profit. So it is not in the interest of any media vehicle, HuffPo included, to stop harassment or bullying. Not when they bring more eyeballs to the site. I like an audience as much as the next writer, but a large audience with so much troll activity is not something that appeals to me. The old PR adage, “just spell my name right,” meaning any press is good press, was proven wrong day after day in every decade of my long career in public relations and reputation management. All press is not good press and all audience is not good audience. So to speak. Ellen Pao, recently ousted CEO of Reddit, wrote a compelling op-ed about the Wild West nature of the Internet in which she notes that its open nature permits the harassment of people for their views, appearances, demographics–you name it. She points out the internet trolls are winning and I agree and am dismayed. I can’t possibly say it as well, so I’d love for you to read it HERE –it’s terrific–and come back to give your views. Intelligent commenters there, too. It’s pretty clear that the lunatics are running the asylum. What do you think can be done? 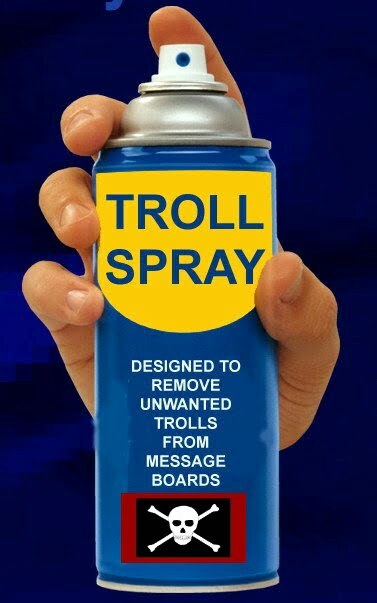 I agree with “Don’t Feed the Trolls.” Any attention just invigorates them. I say go with the power of positivity: give energy to the positive and turn your back on the negative. There will always be critics. Seek out your cheering section and let the trolls eat each other up if they choose. Moderating comments is a choice, but that can be time consuming and energy zapping. I do think that engaging in a catfight is stooping to their level. But in the end, having read these comments and others all day, and waited ’til tonight to respond to you, I’ve come down on how I feel about it: comments on media sites should either be moderated or turned off when stuff gets mean and nasty. While letters to the editor were an important part of journalism, they were moderated and chosen. I think that’s how this should be done by the media vehicle, itself. I’m just not a fan of the free-for-all, nor do I see much value in sites like Reddit, which I’m sure will infuriate some. But, each to their own. It’s surely a pet peeve of mine too, Carol! If I see a nasty comment on one of my posts, I just push the delete button. I can’t even imagine it on your site, Nancy! So many people are just expressing their own opinions and talking about their own experiences and then labeled as “vindictive”, “mean” and “bullies”- if you are called on your “stuff” then you are a short little naked thing with long orange hair! (which I think are very cute btw) If you are going to put yourself “out there” for all to see you have to expect some backlash. Easy fix-don’t spread yourself all over the internet for all to see. Well, the definition of a troll is someone who harasses and bullies online, insults and hurts–it’s not the same as talking about their own experiences. Many, many people find divorce traumatic, even if they are not abused in the process. In that case it would be literally surviving the marriage. Divorce can require a different kind of survival skill. Thanks for weighing in today. It is annoying how many trolls there are out there. I agree with refusing to engage with them and being accountable to yourself by posting positive messages in your comments. I’m glad I haven’t had any negative comments come through my blog yet. If that happens I won’t think twice before deleting them. I really haven’t had the problem, only one psycho pretending to be someone else and posting, which never saw light of day. I don’t know if you read Pao’s essay or not, but thee are bigger issues at stake and that’s what I’m wondering about. It an unfettered internet the best way? Oh, Carol, your last line is the Pandora’s Box. Who is to make the fetters for this new internet? You? Me? Fox News? Congress (!)? I think the issue is larger than you and Pao are making it. It isn’t the disagreement or discord that makes for a troll. Plenty of people had valid things to say about Pao and Reddit; to erase all commenters as the work of trolls is, well, disingenuous to say the least. But here’s the thing. It’s not that all commenters are trolls. The definition of troll is someone who harasses or bullies. I don’t think all negative commenters are trolls, not at all. I do think there is a human decency obligation to have community guidelines. Why is it so easy for WOM to say “this kind of stuff isn’t appropriate to post” but it becomes problematic for other sites? WOM? World of Minecraft? Women Over Men? Women of the Moose? Really–there are about 35 definitions for WOM and these are just some of them. Relax–I meant Women of Midlife–I should’ve been more specific, but made an assumption, but in the end, it doesn’t matter what community it is, the point is the same. I don’t mind criticism. I don’t mind strong opinions that differ from mine. I usually welcome both because it’s what makes things interesting. It’s boring if everyone always agrees with you. I do, however, mind insults, ill spoken innuendos and malicious comments that are down and out lies. Do I expect everyone to play nice. No. I do hope that a level of civility will prevail. It doesn’t. Not on HuffPost. I have trimmed my submissions down considerably because of the abuse I get. But the truth is, I have benefited from being associated with HP. And I appreciate that. I can stand the heat in the kitchen. But that doesn’t mean that it should be an overwhelming heat that is fueled by venom and hate speak. Yes, forums such as this should be monitored. Supposedly HuffPost is. I can report remarks to then if I choose. I never have, so I don’t have a clue what would happen if I did. I’ve never deleted a bad comment. Probably never will. I think situations such as this prevent a lot of good writers from sticking their neck out and sharing their work on a more public forum. To me, that is real tragedy. Thanks, Carol. Loved this post. Yes, the trolls are winning and it’s so sad. I’m a firm believer in free speech — duh — but I don’t think that means we have to let everyone comment on everything. People can’t comment in magazines and newspapers. Why don’t we just disable comments and let people read what they want and discuss in real life? interesting and timely piece. I also read the Reddit essay and Tammy’s article. It is hard for me to know what to say….because I honestly don’t’ get it. I don’t understand the motivation and personality of trolls or mean spirited people in general. I don’t understand why people have to react so personally to another person’s personal story either. In the case of Tammy, her divorce experience was her own. Maybe she had it better than some ….and worse than others. It is all relative. But to receive such angry comments? If i am going to get fired up about something it is going to be about bigger offenses in the world like school shootings, war, abuse.etc. It is not going to be about someone else’s personal story or observation. And yes, trolls should go underground where they belong. And when bullying or threats are involved I think there should be a way to deal with this in a legal sense. All of this make me glad I have a small, supportive audience for my work. I read the other article as well. I think it would be terrifying to go through something like that. I didn’t see the Huff Po. I don’t know what can be done to combat it, it needs something desperately. I never thought about the fact that those companies don’t want to stop it. I don’t really writing anything controversial even though I would if it were something important to me. I did have one troll though and it was even a woman in WML who left me a pretty nasty comment once. Said there was not one thing of value on my site among other things. It bothered me at first, but I just let it go. I’ve seen so much worse. Rena McDianiel recently posted…DID YOU MISS ME? But that’s the thing. What would make someone leave such a comment? I just don’t get it. I have several blogger friends who were getting so much spam (not even troll comments), that they decided not to have comments on their blogs. Usually, I find the discussions in the comments on thought provoking blog posts to be part of what makes the genre interesting, more democratic and different than print media. In the olden days, I think some writers received hate mail—you know, hate snail mail. Whether it is in print or on line, some people will write what they would never have come out of their mouths orally. Although I haven’t had a lot of trolling on my blog (probably because its not popular enough ;-), one of the things I like about the platform is that I, rather than an editor, have control over comments. Having said that, I’ve never deleted any. My default is to moderate the first two comments a person posts. If their inclined to troll, their stripes have usually been revealed by then. The worst trolling I’ve seen on other blogs usually involves politics and it’s brutal.